The House intelligence committee is asking the Trump administration for evidence that the phones at Trump Tower were tapped during the campaign as its namesake has charged, a request reinforced Sunday by an influential Republican senator who says the president must either come up with the evidence or retract his claim. 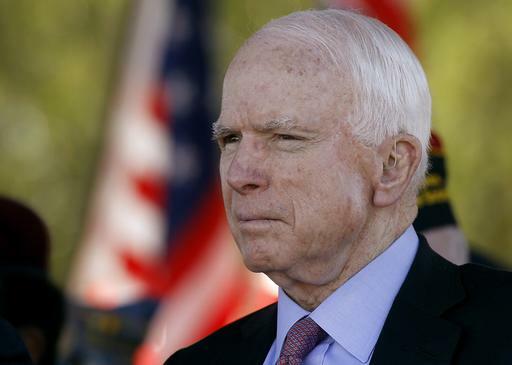 “I think the president has one of two choices: either retract or to provide the information that the American people deserve, because, if his predecessor violated the law, President Obama violated the law, we have got a serious issue here, to say the least,” Sen. John McCain said. President Donald Trump asserted in a tweet last week: “Terrible! Just found out that Obama had my ‘wires tapped’ in Trump Tower just before the victory. Nothing found. This is McCarthyism!” He continued the allegation against former President Barack Obama in other tweets but offered no evidence. The request for evidence by Monday was made in a letter sent to the Justice Department by the House committee chairman, Rep. Devin Nunes, R-Calif., and the panel’s ranking Democrat, Rep. Adam Schiff, D-Calif., a senior congressional aide said Saturday. The aide wasn’t authorized to discuss the request by name and requested anonymity. Early this past week, Schiff said the committee would answer the president’s call to investigate the claim. He also said he would ask FBI Director James Comey directly when he appears later this month before the full committee, which is investigating Russian activities during the election. The president has an obligation to provide evidence that Obama broke the law or retract his claim, the Arizona Republican said. Nunes has said that so far he has not seen any evidence to back up Trump’s claim and has suggested the news media were taking the president’s weekend tweets too literally. “The president is a neophyte to politics — he’s been doing this a little over a year,” Nunes told reporters this past week. Other lawmakers also have asked for evidence. Declaring that Congress “must get to the bottom” of Trump’s claim, Sens. Lindsey Graham, R-S.C., and Sheldon Whitehouse, D-R.I., asked Comey and Acting Deputy Attorney General Dana Boente to produce the paper trail created when the Justice Department’s criminal division secures warrants for wiretaps.